Sailboats 9 m and above (30 ft +). The No. 1 sailboat compass worldwide : double reading, large crisp card and great looks in cockpit. 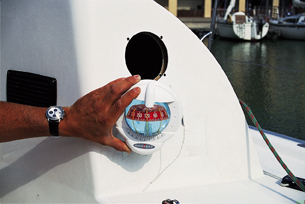 The Contest 101 is the benchmark-compass in the Plastimo range : millions of yachtsmen worldwide keep on the right course with their Contest compass. Its exclusive mounting possibilities allow installation on all bulkheads, whatever the thickness. Double reading : from cockpit and cabin sides. Card : vertical and horizontal graduation so that course reading is equally easy, no matter whether you steer sitting or standing. Universal balance : around the world with one single compass. � Exclusive installation design allows the compass to fit any bulkhead, vertical or inclined up to 25� front tilt. - Regular bulkhead thickness (up to 40 mm) : compass is secured with threaded rods. - Thick or double bulkhead : compass is secured with screws on both sides of the bulkhead. � All parts fully UV-ray treated. Double reading From cockpit and cabin. Conical card, graduated every 5�, apparent � 100 mm. Mounting Comes as standard in a bulkhead version (vertical or 10-25� inclined bulkhead). Can be mast-mounted with the addition of optional mast-mounting kit. � Exclusive installation design allows the compass to fit any bulkhead, vertical or inclined up to 25� front tilt, - either by screwing from the cockpit side, - or by screwing from the cabin side, as an anti-theft security. � Fits any bulkhead thickness : - Bulkhead of standard thickness (up to 40 mm) : the compass is secured with threaded rods. 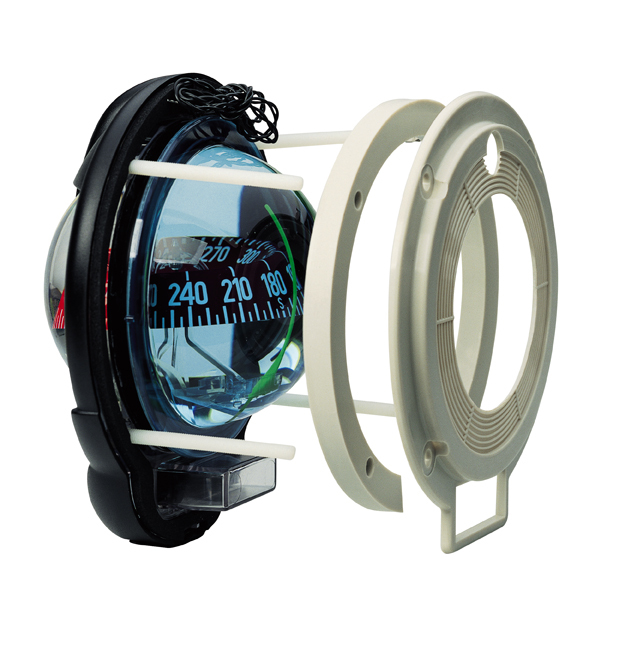 - Thick or double bulkhead : the compass is secured with screws on both sides of the bulkhead. � Supplied with back flange for neat installation from cabin side. Simply swap them without any new hole, and without any tooling. The Contest 101 has the same mounting footprint as the Contest 100 . 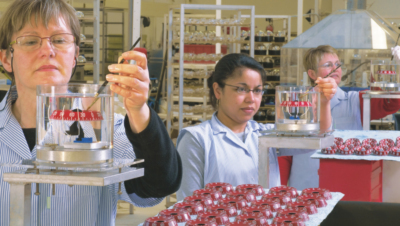 Every compass card is balanced manually to ensure its perfect horizontality.